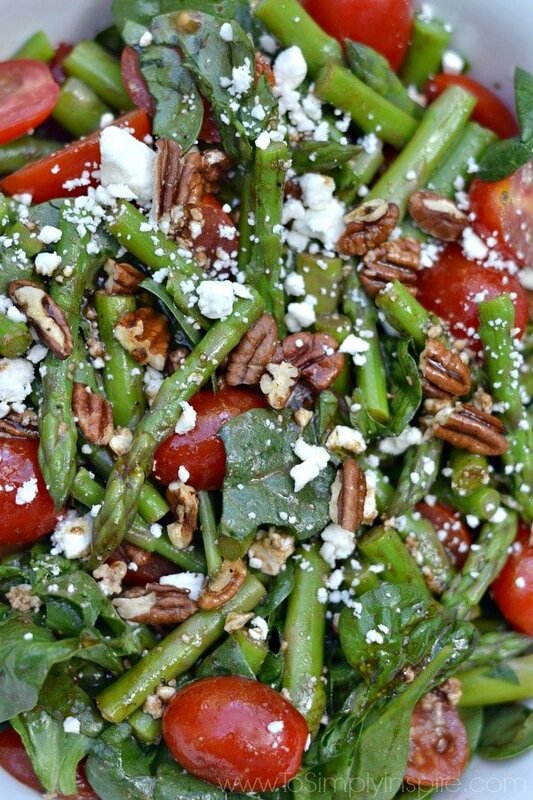 Spinach, Asparagus, Tomato Salad Recipe with tossed with toasted pecans, feta cheese and homemade Balsamic Vinaigrette. 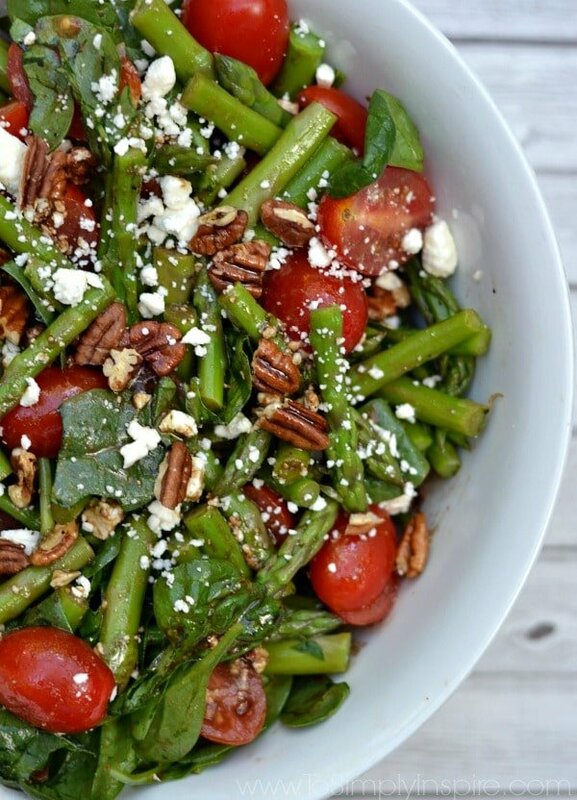 A perfect fresh salad for a meal or as a side. 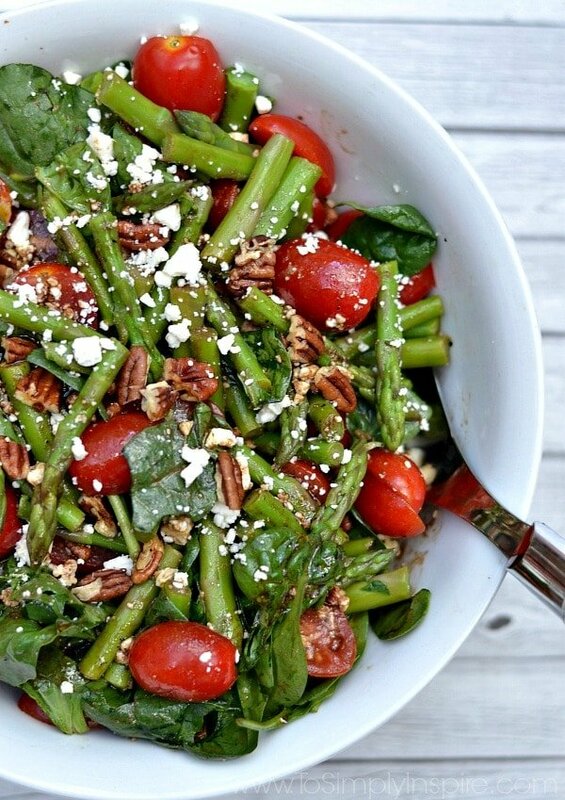 This is one of those fantastic salads that really hits the spot when the weather is hot. We have been on a long, hot, very dry streak (for up here in New Hampshire) and I was craving a big ole salad this weekend. I stopped by Stop & Shop to grab some ingredients on Saturday. They have the most amazing selection of organic and “free from” Nature’s Promise products that are extremely affordable. I mean tons of items all over the store. 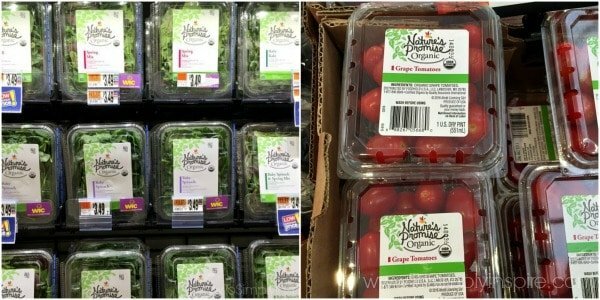 I have been trying to incorporate organic products in our lives more and more and their products help me do that so much easier when the prices are so good. I absolutely love that Nature’s Promise products are free from all the yucky nonessentials such as, artificial colors, artificial flavors, and artificial preservatives. 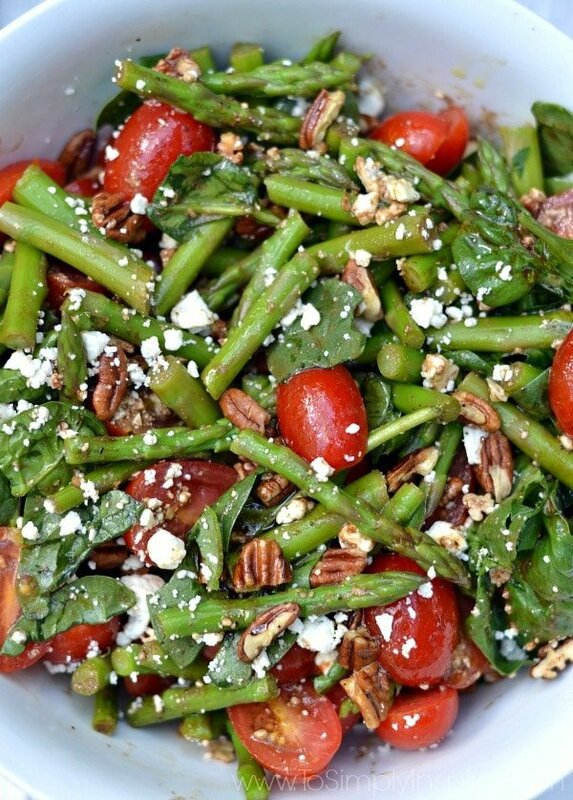 I wanted something simple to make so I chose spinach, asparagus and grape tomatoes and then added some yummy toasted pecans and feta cheese to kick up the flavors and topped it with my favorite homemade balsamic vinaigrette. 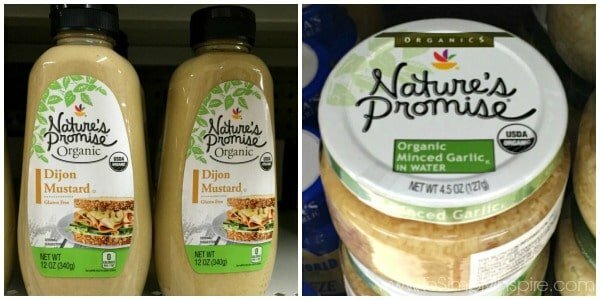 I picked up Natures Promise dijon mustard and minced garlic to use in the dressing as well. You can also Load Offers for Nature’s Promise Products To Your Stop & Shop Card Here for extra savings. Using mobile? Click here to load offers. I served it with grilled chicken with this amazing marinade ever and cilantro lime brown rice. 1/2 cup chopped pecans or sliced almonds, toasted (I heat them in the microwave believe it or not. 1-2 minutes on a paper towel and they are nice and toasty. Prepare this homemade balsamic vinaigrette and set aside. Trim the tough ends off of the asparagus and cut into 2 inch pieces. Add asparagus to the boiling water and boil for approx. 4 – 5 minutes, until just tender and still crisp. 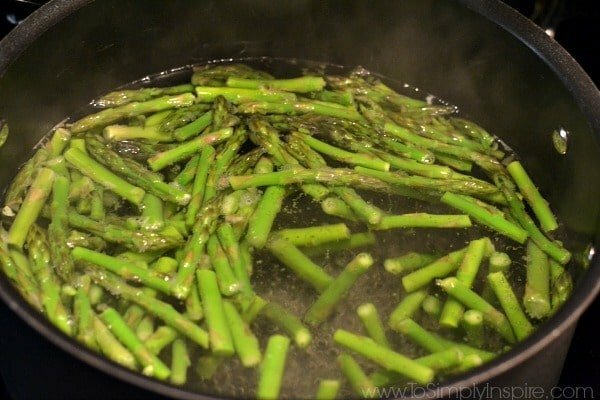 While the asparagus is cooking, fill a medium sized bowl with ice and cold water. Pour the asparagus into a strainer to drain and then immediately transfer it to the ice water for about 10 seconds. Then drain asparagus again. Place the baby spinach in a medium sized bowl. 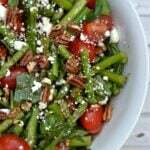 Add the asparagus, tomatoes and pecans or almonds. Drizzle desired amount of vinaigrette over top and toss lightly. Sprinkle with feta cheese. Toss gently again to incorporate. 1/2 cup chopped pecans or sliced almonds toasted (I heat them in the microwave believe it or not. 1-2 minutes on a paper towel and they are nice and toasty. Drizzle desired amount of vinaigrette over top and toss lightly.Sprinkle with feta cheese. Toss gently again to incorporate. What a great dish, this looks delicious. Thanks so much for sharing with us at Full Plate Thursday, your recipe is great! Hope you have a wonderful week and come back to see us real soon. Looks delicious, thanks for sharing with Hearth and soul blog hop pinning and tweeting. Sherri, Asparagus is so good. The salad looks delicious. Sylvia D.
This is such a must try in our home and thanks for sharing!! Please come on over and share this on our blog hop we have Wednesday thru Sunday. Thank you for taking time to stop by and share your recipe and blog on the #OMHGWW this week. That looks so pretty and delicious! Yum! !